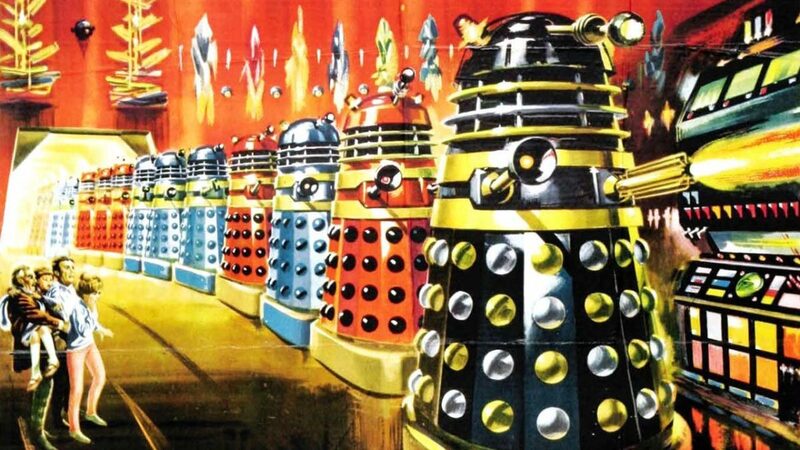 Dr. Who & The Daleks is the first of two feature films based on the classic BBC TV series Doctor Who. They are, as the fans say, “non-canonical,” and thank god for it. The TV series was a true all-ages affair; typically enjoyable for children, but with extra layers of subtext for grownups (or at least attractive ladies for the dads). But this movie is dumbed down to the point where it’s dull and condescending to even the youngest audience member. Screen legend Peter Cushing plays “Doctor Who” (in the movie, that’s apparently his actual name) as a silly old (human!) man, a harmless mad scientist. The other characters don’t fare well either. The original TV incarnations of Ian and Barbara were both intelligent and capable, employed in the noble profession of school teachers. This Ian is a total prat, serving mainly as comic relief, and Barbara is reduced to a screaming plot device. Other things grate to longtime fans (it’s “the TARDIS,” not just “TARDIS”!) and regular viewers alike (the music is wretched). Truth be told, cheesy effects and silly technobabble are actually great pleasures to be found in the original series, but the extra money spent on the movie must have gone to the wrong places (the sets and extra Dalek props, evidently). The advanced Dalek technology includes lava lamps (I’m not kidding). And make up your minds, Daleks, is it a neutron or neutronic bomb? And finally, if it’s pitched so low, what are the moral lessons it has to teach youngsters? Based on what The Doctor has to teach the naive glam-rock aliens threatened by the Daleks, don’t trust anyone who claims to want to help you. Instead, fight and kill them.